How to Channel… Free Intro Video Class! Learning to channel changed my life in the best possible way. Before I learned channeling, I was confused and felt lost in life. If it wasn't for learning to channel I probably would never have started Ask-Angels.com and we would have never connected. Now, you can learn to channel with my channeling teacher, and for the first time ever I'm able to give you a channeling class with her for free! In the video below, you will learn to channel from my channeling teacher, Betsy Morgan Coffman, who connects in this FREE Channeling Class to give you a firsthand experience with learning to channel. Watch or listen to learn about channeling, what it is, how it works, and to actually experience the energy of channeling for yourself! You will be guided to enter into the channeling space, to connect with your channeling guides, clear your energy, raise your vibration, and align with the knowing that yes, you too can channel! This class alone is worth at least $50… But thanks to Betsy Morgan's generosity, I've been able to get her permission to give it to you to watch, FREE! Simpy click play on the video below to watch this How to Channel Class for Beginners free! If you would prefer, you can listen to the .MP3 of the video, that is also found below. Or Listen to the .MP3 Recording of this Free Channeling Class here! Simply click the link below to listen… Or press and hold on phone/ tablet. This video with Betsy Morgan on Channeling has now been transcribed here for you as well! Hi! I’m Betsy Morgan. And I am here to share with you lots of great information about channeling. Now, I know some of you have met me before, and some of you are meeting me for the first time. I welcome you to this moment. It’s possibly – and my hope is that it will be one of the greatest moments of your life. Channeling is an incredible spiritual and personal adventure that will help you to have more happiness, to feel more peace – more inner peace, and to have a stronger connection to what you call “God.” Channeling is an experience to me of love in action, and how it actually feels as it moves through you. In this channeling class, I’m going to offer to you an experience of feeling the love of channeling. I know that when you channel, you can get psychic experiences. And that's part of the fun – part of the allure of why people want to learn how to channel. It is a mystical art form. It is an opportunity for you to learn how to be a medical intuitive – to be psychic, to see predictions in the future, to do incredible energy healing work. There are so many wonderful things that you can do once you open to channeling. The intuitive channeling when you use the Orion technique will open your heart and your higher chakras. Channeling is an opportunity to actually shift your state of consciousness in the higher levels. So, what is consciousness actually? Consciousness is your awareness – the awareness of knowing who you are and how you relate to life, how you feel about other people, what you believe in, and how you respond to life. Do you know that every response creates an outcome? And every outcome brings to you an opportunity to choose a belief about life. And if we’re not consciously aware, sometimes, we’ll choose a belief that’s not so healthy for us. It doesn’t bring us a future outcome of greater happiness. When you learn how to channel, you become more aware that choice is a very important part of channeling. And you begin to make conscious choices to recognize that you (as well as myself) – we project our consciousness, our awareness of life into the physical dimension, we receive a physical experience from which we get an outcome, a perception of reality, and then we react. With channeling, you become more aware that there is another component in your mind – talking to you, trying to run your life if you're not aware of it. And that's called “the ego.” This is something we learn a lot about when you take the channeling classes. Between now and then, simply choose to be aware of a couple of things. You have the power if you choose to take it. Whenever you create an outcome in your life, watch your responses and choose a response that’s loving and happy. What you’re actually doing is preparing yourself to channel. When you channel, information from the higher realms of consciousness comes in through you, comes in a chakra – a vortex of energy at the top of your head, comes down through you, and exits to your throat through words, and your heart through energy. And this response (hopefully if you are an alignment, if you’re willing and allowing) will be a loving response that’s in alignment with what the guides are wanting to say to you, to your friend, or to your client. Let’s make this a little bit easier. Channeling is speaking love from higher realms of consciousness. You and your consciousness are one. This trick – the key is because we have five senses, (sight, taste, touch, smell and hearing) we often unconsciously identify who we are with what we see physically – thus, we think we are the body. Do you know what death is? (I’m sure you do, but maybe we haven’t thought about it.) It’s just consciousness leaving the physical body. You don’t die. You are more your consciousness than you are the body. So, when we talk about channeling, we are using our higher consciousness, more love, and it feels so good. When you channel, you get an opportunity to feel your clarity – what you really want in life, and you begin to hear from the higher realms how you can achieve that, what steps to take – step by step by step in order to get the outcomes that will make you a happier and healthier human being. Channeling makes you more aware – thus, more conscious. It actually lifts your frequency. It makes you happier. And yes, when you channel, you will be able to be psychic. Channeling opens up a wealth of opportunities. And what you will develop really depends upon what your soul has already chosen to develop in this lifetime. Channeling is a skill that can be learned. All that you need to have (really) with you when you show up to learn channeling – is willingness to learn, a desire to learn. And I would say, maybe be patient with yourself, and be willing to persevere – because with any new skill, there is a beginning, a middle, and an end. You will in the beginning – like you learn to ride a bike. You might fall off the bike. If you could have a sense of humor about it – pick yourself up, dust yourself off, start all over again. Just practice. When you learn the Orion technique, you will find that there are steps that you can follow to make this very easy, and lots of fun. Did you know that right now, you have many guides around you? Now, the guides that are coming to help you are guides that actually harmonize with your intention. You may not be consciously aware of what your intention is and how you can be happier and what you really want in life. I know you want to know what that is. But the purpose of your guides is to tell you, to give you those answers, and to encourage you along that path. Your guides love you and they’re with you right now. They’re here to help you. They’re here to help you by feeling the love or hearing it or actually, with your inner vision – seeing the answers through symbols or words. Each one of you has a special way to receive the information from your guides. And when you take perhaps an online class or other classes – every single class you take is infused with Orion’s energy. His gift is the gift of energy or frequency – higher level frequency. So, what he does is simply lift your vibration. There is a law that the highest frequency wins. So, when Orion comes in to work with you, he lifts you up, so that you can connect with your guides easily for the rest of your life. Your guides vibrate at a higher frequency – thus, they have the ability to see further ahead than we do, and to know you sometimes better than we know ourselves, but to help you to know yourself very well. For instance – One of the questions that I feel spiritual people really want to know – And this is an age old question, but I’ll present it to you now because I think it’s fundamental and I think it’s the bottom line of everything. When you learn how to channel, you begin to approach these answers – not just with your mind, but you feel them with your heart. And the vibration starts to integrate with your being – thus, allowing you to shift and raise from being simply human which is good, but you can be divinely human which is – more aware, having a higher state of consciousness, more empowered, seeing more clearly, and having the courage to take action on what you really want to do in life for yourself, and when you channel four others, for them. The words that you speak when you're channeling will come power-packed with a frequency of courage. So, when your friends hear something that they resonate with, they will be motivated to take action on those words. So, the words you speak when you channel are important. It helps the mind to know, see, feel and take actions step by step on what is said. But the words are not more important than the frequency from which they come – the frequency of love. Channeling is a path of the open heart. And when you're speaking from the state – a subtle shift in consciousness from the state of channeling, the vibration of the words goes to the point of origin of a mistaken thought. Perhaps some of you have read some of a course in miracles. And there's a line is there that’s probably my favorite. “Dear God. Please heal us of our misperceptions.” All of us are doing that right now – whether we know the words for it are not. I think words are very important. That’s one reason I love channeling. Words are tools for our mind to use to help us move forward in our self-healing and in helping other people heal. l think when you learn how to channel, you begin to consciously or unconsciously recognize the importance of words, and maybe you’ll even increase your vocabulary because words become a tool for the listener. And as you let your guides use your vocabulary, they create a – I like to call it a rainbow bridge, so that your clients, your friends and yourself can cross over from where you are now, whatever level of happiness you’re in to a higher level of happiness. Words can do this. They help a person move forward. And the vibration of the words also helps because at an unconscious level, the person to whom you are speaking shifts their consciousness – thus, lifts their frequency, they do an internal healing, and then they have more power, self-confidence and happiness to make a better choice and receive a better outcome. I have so much more to share with you. I would like to share with you very basic information. What is channeling? How do you channel? Who are your guides? Where do they come from? Oh! This just came up for me and I want to reassure you – Channeling is for some people a mystery, and they become a little afraid of it. I want you to know that never have I (in over 25 years of teaching) ever brought in a bad guide for myself or anybody. So, when you learn how to channel with the Orion technique, you will bring in high level loving guides that want you to be happy. I also want you to know that you'll be bringing in light. When you do this, you and I and everyone goes through a cleanse – and a cleanse can be physical, emotional, spiritual. There are different levels of lifting into a higher vibration. But the lower vibration cannot lift. It must be released. If you feel what you might call negative emotions, sadness, grief, fatigue, anger, you could be cleansing. And if you are an empath, (something else we’re going to talk about on our class) that means you feel energy. And sometimes, if you’re an empath healer, you will draw into your aura and then process it. We will talk about how you can release that, cut the cords, get rid of that lower energy, so you don’t have to deal with it. You don’t have to deal with low energy. You can stay in the high frequency. Ask for your guides from this point forward. Ask for high level loving guides to help you. They will. You don’t have to take another class. They’re with you right now. They know you're interested. They know you have a desire to know more, so they’ve shown up. All you need to do if you find yourself in any of those lower states – Ask for a guide that loves you, who can help you to lift into happiness. Allow them to work with you. My guide and yours – Orion, our teacher guides says, “Listen, trust and act on the information that your guides bring into your awareness.” If you listen but don’t act, the information kind of stagnates. It slows down. But when you listen, trust and act, more information will come through. This is part of the practicing that we were talking about earlier. Be aware when spirit impresses upon your thoughts or your emotions of a feeling or some words or what to do. Just listen. Feel in your heart. Does this feel good? Does this resonate with me? And if it does, trust it and take action on it and then watch and see what happens. You are by nature, intuitive. And channeling becoming psychic is a skill that can be learned. These two come together. The body and the mind cooperate. They work together to help bring this love into the world – the love of channeling. The mind has more consciousness and it is not part (I would say) of the body per se until it connects with the pituitary gland and the brain. In that, they come together and start connecting. When you open to channel, the vibration of light comes into your crown chakra, moves through the pituitary, and your third eye opens it, so that you start to become more psychic, clairvoyant, you begin your natural gift of mediumship, comes down to your throat, opens your throat. When you speak, you speak with a vibration of healing love. It comes to your heart. You start to love everyone. It’s a wonderful, wonderful experience. You find yourself less judgmental, naturally happier, flowing with life, feeling better about yourself. It’s amazing. And then, it moves through your entire body – every cell of your body, and you actually are radiant with more love. You become magnetic. You will find that you will have more people attracted to you – more friends. I always think – Be gentle with them because everyone is sensitive and everyone has a heart. When you channel, your frequency goes up, you become happier, your vibration is brighter and people are attracted to that. People (if they’re healthy) like to be around high vibrational people because you by nature then, will lift them into a higher frequency. Now, I want to get back to one point. I find that people today are much more interested than they were 25 years ago about this negative energy. I want you to know that you have more power than any negative energy. Own your power and know that you and your guides and God – My God is a big God. How big is your God? Now, if you’re an atheist, that’s okay with me. This is not about religion. It’s not. But I might say it is a very, very spiritual path. It’s helping you to let your personality come into alignment with your soul’s plan. And when you bring in this light, it naturally comes together and gets in sync, so that you can be in integrity with your higher self and you can live that integrity in such a way that you’ll love yourself better and you feel better about life. So, this business about low vibration – It almost is a choice. How often do you think sad thoughts? How often do you worry? It’s kind of a silly question. I’m asking you a question that I already know the answer to. Every day! All of us do because we are human. We have habit patterns – some that are not so good for us. And that is if we’re not vigilant and watching our thoughts, we often think negative thoughts. The same thing goes through about channeling – there’s a coordination here. When the light of love comes in to you, I want you to be aware that the ego voice is going to tell you you're silly. How often do you hear that during a day? I’m sure at least, once a day. It might tell you, “You’re wrong. You’re not good enough. You can’t do it.” That voice is still going to be in there. When you learn how to channel, you will learn how to deal with that voice and stay focused on the love. Practice that in your life through self-love. If you would like to prepare to learn how to channel – which I hope you do. I would love to meet you. I’d love to get to know you better. So, the way you can prepare is – Believe it or not, this is a good preparation. Love yourself more. The foundation of being a good channel is self-love. The foundation of living a happy life is self-love. Give yourself some permission to have a mental health break. Take a day off. Go for a walk. Be good to yourself. Laugh for no reason at all. What do you want to do that you’ve been putting off? Because you’ve told yourself, “There’s not enough time.” If you say there’s not enough time, that’s a belief that you are perpetuating and thus, you will create “There’s not enough time” to justify your already preconceived idea that there is not. Whatever belief you have will become uncovered. And whatever negative emotion that has gotten stuck in your body, into your emotional field from this life or a past life, the light will find it and bring it up. And that’s the cleansing that I’m talking about. So, when the light and a love of channeling comes into you, it will find the unhealed places. And those don’t feel good in the first place. And so, we often have stuffed them. When we want to lift to a higher frequency, that stuff can’t lift, so it has to leave. When it lifts and you cleanse and it leaves, it might not feel good. And so, I call that negative energy, lower energy. You’re just doing a cleanse. What do you do? You call in your guides and you ask for help. Your guides and your angels can do so much more when you call them in. They’re willing to help you. They want to help you. That’s their purpose. And I might ask you, “What is your purpose? Why are you listening to this and watching this video?” You know, if we don’t live by conscious intention, we will sometimes be carried away in the flow of life. I always suggest to my students when we begin a class, “What is your intention for this class? Could you please get in touch with that?” Because if we know where we are now and where we want to be, there’s a more direct line to achieving it. So, what is your intention with this video? If you hold that intention, you will notice you will achieve it. My intention is that you feel the vibration of channeling, that you feel the love and the excitement, and where it can take you as an individual. Remember, there’s no cookie-cutters in channeling. Channeling is a healing art form of love that can come through you with a spoken word – through your eyes, through your creativity of writing. It can help you to be a better life coach, a massage therapist, a reiki master. It can help you to be a channel for a living. It can help you simply be a happier person – a better mom, a better dad, a better nurse or doctor, a better teacher. Channeling helps in every way that I have experienced. If you find that you are a person who likes to help people, you’re perfect for channeling. I also wanted to remind you that if you’re a person who wants to help yourself, you’re a good candidate for channeling. Remember, self-love is the foundation of a good and a happy channeler. I also want you to notice your imagination because we will do this exercise here in a few moments. We might call on our imagination. I would suggest that in your learning how to channel, the next step after self-love and loving yourself more and more without judgment – If you judge yourself, just notice it, forgive yourself, let it go and start all over again. Just let it go and start all over again. Learn to live in the moment. Let the past go. Love yourself now. The next step would be to honor your imagination. If you can imagine it, you can have it. So, when you are channeling, believe it or not, the highest chakra on your body is your channeling chakra which is also the chakra of your imagination. And so, when the light comes through, this chakra – it stimulates your imagination which is perfect for channeling. Your imagination is going to assist you in bringing through the words and the images that spirit wants you to speak out loud for the benefit of yourself, your friend or your client. And as you practice, it will get easier and easier and you will get happier and happier. This is humbling. I’ve had so many people email me, write me, call me, thank me for a life change that they didn’t expect from channeling. Yes, you will get psychic predictions. Yes, you will see into the future. Yes, you will be able to be a medical intuitive. Yes, you can be a medium. Yes, you can be clairvoyant. Yet, what I find myself talking about, because to me – And this was a surprise to me. I wanted to channel for all of the other reasons. I didn’t expect what I got was more God in a word or two. An experience of exquisite love, undefinable love – always increasing, always expanding, always shared. A sense of harmony and unity with life, and more of a connection with the all that is, is already here and now. It's absolutely phenomenal. There's no dogma, there’s no rules, there’s no church, there’s no politics. It doesn’t matter what gender you are. None of that matters. It doesn’t matter – your age, your wealth, nothing. That’s not identification with form. It is formless love that comes through you – speaking its own truth in the moment. And it is beauty, it is wisdom, it is kindness, it is respect, it is precious. It is precious. And I’m just excited for you to get the experience. So, let’s do that right now, shall we? Now, to prepare, I would say – be willing to let go of all preconceived belief systems about what you think being psychic is, what channeling is, what feeling higher love is. Let go of all of it and let your experience be what it is. It’s going to be perfect for you. If this is your first time experience, this is a wonderful sacred moment. If you've had this experience before, don’t try to duplicate something that you had yesterday. Let it be. Every time I channel, it’s different. You don’t have to know what they are going to say. I never know what they’re going to say. Just trust them. They know. We’re the vehicle. We’re the channel. We let the light come through us and speak to us. And the light is filled with the vibration of love that shifts our consciousness and lifts us into happiness. So, let’s see and hear what the guides have to share with us. So, our intention is to feel the love of our guides, to feel the feeling of channeling. And perhaps, if you want to hold the intention that you begin to feel the presence of your channeling guides because they’re here. I notice that I clear my throat often. What happens is the guides are preparing me. Our throats are very important in channeling. And so, sometimes, I clear the throat to channel to prepare for a stronger vibration, to vibrate with the words that come through. So, now as we begin, let us sit in a comfortable and a relaxed position. Good. Close your eyes and take a nice deep relaxing breath. Maybe one more for good measure. Very good. And drop into your heart. Good. And now, I’m going to invite in my guides and my trio of light. It’s Jesus, Archangel Michael and our teacher guide – Orion. As we sit in a comfortable and relaxed position, I do invite the highest, most loving angels – to love us, lift us and protect us, and I invite in my trio of light. Thank you so much. Indeed, beloved angels, earth angels, all, please know that it is I – Orion indeed, here with the one known as Jesus the Christ on my right and Archangel Michael on my left. Indeed, dear beloved, earth angels, all, we are with you. We are projecting (as you would say) the radiance of the divine. I am light of all that is through this one singular being of light – whom we know and love as Morgan, who you know as Betsy Morgan. Her energy field now expresses itself by expanding into greater light. And thus, we have a vehicle to come to reach you. We reach you with radiance of high intent that you feel the love of the divine I am. And in doing so, beloved child – you will feel the love of who you are. You are the love of the divine. I am. You are God’s light manifested in a human form. You are the light of God. You are the light of the world. You have the potential and the capacity to be a spiritual leader. Why, indeed? You have the potential and the capacity to be a savior. We do not want to burden you with that. You are supposed to be a savior of all humanity. Know indeed – for the Christ birth is now individual self-empowerment and acceptance of who you are, the beauty and the love of God expressing itself as a single spark of humanity. If you, but save yourself, you are doing all that God asks of you. How can you save yourself? Oh, beloved darling one, we say the answer is simple and easier said than done. You save yourself by forgiveness. Forgive yourself and others of everything. It is nonsensical. It truly never even happened. When you cannot forgive, you are identifying who a person is with physical form, and they are not form at all. They are the light of God expressing, but they have simply forgotten it. And thus, they have fearful reactions to life because they believe they are what they see. They believe they are limited. They have forgotten their beauty. They have forgotten their limitless nature. They have forgotten God and I are one. God’s will is that I am happy. I can have everything and anything through love that created me. So, right now, we work with you at the level of intention and energy and spiritual fulfillment – to lift you in frequency to the realm of that where everything is already created. You live in a wonderful sea of energy – infinite potentiality. And through the law of attraction, whatever you focus on and feel and desire and feel with gratitude (as already having it) is through law automatically attracted to you into form, so that you can see in form the level of your consciousness. We are cleansing out old, antiquated, stale, negative, limited, false thoughts, and leaving in its place – light. “I am divine. I am one with God. I am that. I am.” We are bringing into you the frequency of laughter and joy and peace and wealth and health and love and happy long term relationships, inner peace and peace of mind, self-love, creativity, clarity. We now bring in some of your family members from the stars. 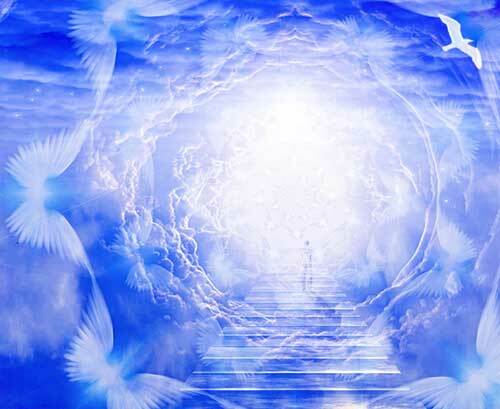 We bring in some of your friends from the angelic realm and we increase the frequency. We now want you to participate. Yes, you who are listening silently to yourself. Please say silently, “I now invite my highest and best channeling guides to come to me and help me to feel your love, your light and your energy. And I invite Orion. I invite 100 thousand angels and archangels. l invite happy, loving star beings who are here to help me be all that I can be in this incarnation. I invite my star being family if I have one. I am now reconnected. My heart, my mind, my spiritual intention, my actions, my vibration and my consciousness is now 100% connected to my soul plan. I feel and I acknowledge the presence of my guides, my angels, my teachers, my higher self. I allow myself to be comforted by specifically calling in my spiritual teachers who I am already trusting and comfortable with. And I lift higher. I lift off the third dimension into the fifth, into the seventh, and into the twelfth. I invite golden light to pour upon me – especially into my crown chakra. Yes, I feel and I acknowledge the subtle energy shifts. They have happened. I have received a cleansing. I am higher in vibration. I am more connected to my guides. I am open to channeling. I feel the love of truth. I feel the presence of God itself. And I feel that I am one with that. I am one with all humanity. I am innocent and I am strong. I am powerful and I am creative. I am loving and I am good and I am forgiving. And I extend this blessing of who I am into the world that the form of the Almighty might come back for me, to me, and for the highest good of all concern – for we are one – one life, one love and it is good. It is good. It is good. And I lift on the vibration of that. And in this high frequency, I clarify my intention. And if I don’t know my intention, I invite my channeling guides and my teacher guides to tell me what my intention for listening to this video and receiving this energetic blessing and initiation of light is for. What is my highest good from this experience now? What should I do next now? What is for my highest good? What is my soul’s intention? What is my soul’s path? What is my next step to actualizing my soul path? Listen, trust and ask for the courage to act on what is impressed upon your higher consciousness. As you are in a state of love and many, many most of you are in the channeled state, this is how it feels. Good and loving, peaceful, joyful, unified, expanded, calm, one with God. We are all one. What I think about another is first given to me. And what I think about myself is energetically and silently project it into the unconscious awareness of another. We are all one. Cleanse, cleanse, cleanse. All them is the thinking off here. Fill with white and golden light – every cell of our body, every level of our energy field. Lift higher. And now, dear Orion, dear God divine, dear all that is, let my friends now connect with their guides and feel their love. Whether you are weeping or not, whether you have felt it or not, your guides have touched you, they have connected with you. Everyone’s first experience or tenth experience is different. Remember, please accept whatever you get with gratitude – for it is perfect for you now. And now, Orion wants to come back in. Dear beautiful children of light, I am so proud of you. I am so pleased at your progress. Please know that I know for many of you, this is but a beginning. You can continue on from here. Call upon me daily – for this is a healing art form that needs practice and repetition or your mind will tell you that it happened not, that it was made up or you can't do it again. We love you. And now, thanking your guides – let them go. Yes, some of you may have felt the shift immediately. We are assisting you in coming back down into your physical vehicle, your body, this beautiful temple, this sacred temple. Treat it well – for without it, your consciousness could not exist in this realm. And this lifetime is your opportunity for complete enlightenment. Channeling is a path to enlightenment. But we do not want you to have channeling as an intention to go anywhere, to gain anything, to do anything. But simply, for an experience of being who you are, try not to achieve anything because there’s nothing to get. You are already that. You are already that. Just be with the energy, and the energy will take you home. And I thank you. I thank you with all my heart. I hope I get to meet you. In the meantime, I know that I am one with you – not just connected to you. I am you in the most sacred way. And so, I’ll be good to me for you. You be good to you for me, for the world. And together, we will take this world to incredible new heights of love. l wish you well. I wish you love. And I hope to see you again. Can Anyone Learn How to Channel? Thank you so much for this gift. It opened my heart and cleansed so many broken pieces. I wept from feeling the love. I am going to try to continue as much as possible on my own because I am currently unemployed and can not afford the program but soon I will. I now truly feel in my heart the love you spoke of. You have changed my life forever! I’ve always felt something is missing and you opened my eyes and heart!! I could never thank you enough!!! That’s great to hear Debbie! Amazing things can be accomplished one step at a time! Thank you for a beautiful introduction , I have already begun to channel as it happened spontaneously last year , but then it shut down and I didn’t know how to re access the ability . So now I feel I have been brought to the perfect person , thank you Betsy ! Thank you Thank you Thank you Melaine and Betsy…..Lots of Blessings…..
Blessings and love……….thankyou, thankyou, thankyou……..Namaste…. Thank you so much Melanie for this awesome experience and extend my gratitude to Ms. Betsy Morgan! I love you and I appreciate your beingness as always!